Last time I wrote about the Hubble constant, and how observations show the universe is expanding. Of course if the universe is expanding it must have been smaller in the past. We can use this idea to trace the history of the universe back to a point when the universe was a hot, dense fireball known as the big bang. Our simple calculations put that point about 14 billion years in the past. 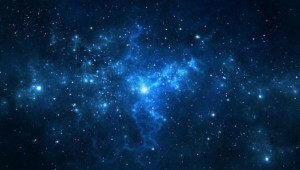 More accurate calculations put the age of the universe at 13.75 billion years. Evidence of an expanding universe doesn’t prove it began with a big bang. Claiming the observable universe was once smaller than an apple is a pretty crazy idea, so you’d be right to ask for more evidence before taking the idea seriously. Fortunately we happen to have a great deal of evidence. One of the earlier indications is known as the cosmic microwave background. When objects get hot, they give off light. You can notice this with glowing coals, incandescent light bulbs and the like. It turns out the light a hot object gives off follows a specific pattern known as a blackbody spectrum. If you look at the intensity of a blackbody spectrum as a function of its color (or wavelength), you notice shape of the function depends on the temperature of the object giving off light. If the whole universe really did begin in a hot dense state, then it must have released a great deal of light. As the universe expanded its temperature would cool, but we should still see a blackbody spectrum radiating from every direction. It turns out that is exactly what we see. 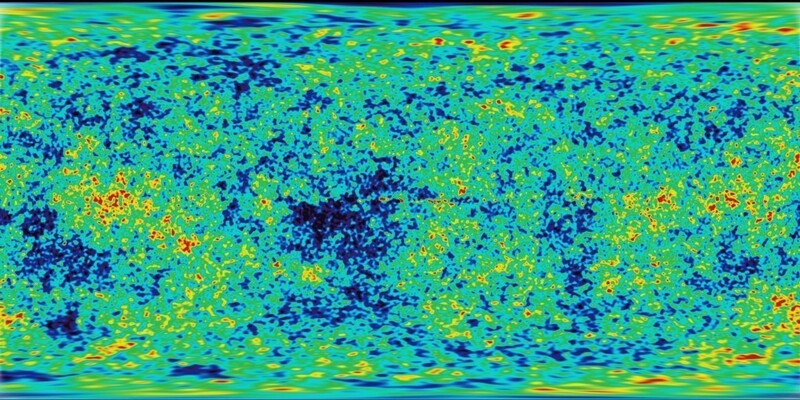 Thermal spectrum of the cosmic microwave background. 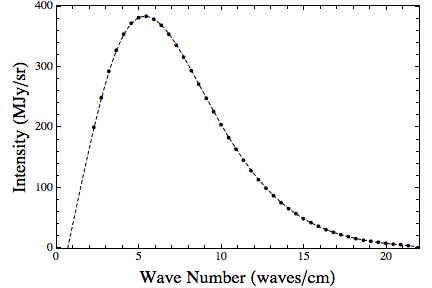 In the figure above I’ve plotted the observed light spectrum seen from the cosmic microwave background. I’ve compared it to a blackbody curve. The data matches the curve exactly. I mean really exact. The error bars on the data are too small to plot on this graph, and the curve still fits. Of course this means we can use this curve to determine the temperature of the universe. From the fitted curve in the graph, I get a temperature of 2.73K, which is very close to the accepted value of 2.725K. This temperature is also exactly what you would expect if the big bang occurred a little under 14 billion years ago. How cool is that!